First, slice each chicken breast into 3 pieces lengthways, and pound until thin. Then grate the Parmesan and fontina, chop the parsley and 4 slices of lardo. Mix together with some salt and pepper. Spread the mixture onto each chicken slice. 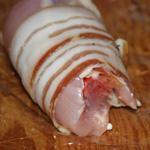 Then roll up the chicken to create an ‘involtini’ and wrap with the remaining slices of lardo. You can secure with a toothpick or some kitchen string. Cover a baking tray with baking paper then lay the involtini on top. Sprinkle with olive oil, and roast for 20 minutes. Wash the rocket and dry it before putting it into a blender with the pine nuts, Parmesan, Percorino and garlic. Add a good pinch of salt and some of the olive oil. Start blending at a low speed, gradually adding the rest of the oil until you have a smooth mixture. You can keep it in the fridge for a few days, just be sure to cover with a layer of olive oil and keep in a closed container. 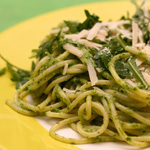 This pesto is of course wonderful enjoyed with pasta! Add a small amount of the cooking water when you stir in the pesto to make it extra silky. Sprinkle the final dish with a few leaves of rocket, pine nuts and a sprinkling of grated cheese. Squeeze the Moro oranges and filter the juice with the help of a strainer until you get roughly 0.5 ltr of juice. Now put the juice in a saucepan and add the sugar, stirring it on a low heat until the sugar dissolves, but don't let it boil. 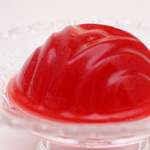 In the meanwhile, let the gelatine sheets soften in a bowl with some cold water for about 10 minutes, then remove them and add them to the warm juice, stirring until they’re completely melted. Now dampen the inside of 6 small silicone moulds and pour the gelatine into them, let them cool down and place them in the fridge covered with some cling film until firm. Finally, turn the moulds gently upside down on separate plates and decorate them with some orange peel or some whipped cream and chopped pistachios. Stir together the flour, baking powder and caster sugar in a large bowl. Add the egg yolks and milk and whisk until you have a smooth batter. In a clean bowl, whisk the eggs whites until you have soft peaks. Then gently fold into the batter. Heat some butter in a large frying until it melts and starts to foam. Ladle the batter into the pan to form medium circles. Cook for a couple of minutes until bubbles start to form on the batter. Now it's time to flip the pancakes, using a spatula. Cook for another minute or so on the other side. 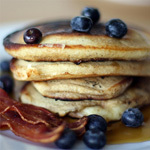 Remove from the pan and keep warm while you prepare the rest of the pancakes, repeating the process until all the batter is used.